Do you ever wonder where those robust heads of lettuce, spicy bunches of mustard greens, and deliciously crunchy bundles of bok choy come from? Have you noticed that these items are often locally grown and delivered to the Co-op fresh from the farm to our cooling racks? Here at the Co-op we spend a great deal of time collaborating with local growers and producers to make good food accessible to more people while supporting local production. One such farm is Left Foot Organics. This goal is achieved in a variety of ways. One way is through programs such as Growing Partners, a collaborative endeavor with Children and Youth Services, which attempts to model inclusive community development by fostering relationships with typically developing youth and developmentally disabled youth. The hope is that the youth will take the knowledge, skills, and compassion they gain in the program with them throughout their lives. This relationship can help break down the pressures of peer modeling and provide a safe space for people with developmental disabilities to feel integrated and supported. Inclusion is key to this work because people with developmental disabilities often communicate differently, sometimes non verbally, and without an inclusive environment, they are shut out and alienated. As we walk amongst the rocky, weedy fields of lettuce, basil, cabbage, and other sundry offerings I begin to feel my body relax. Suddenly the cars passing nearby are less noticeable, and the sound of Ann’s voice is more audible. I even reach down and start pulling weeds from the parsley as Ann introduces us to Heide, one of Left Foot’s oldest growers and best friends. Heide loves the farm and is clearly proficient in her work. Where she was once very shy and in need of a great deal of one on one coaching, she now works independently and steadily. 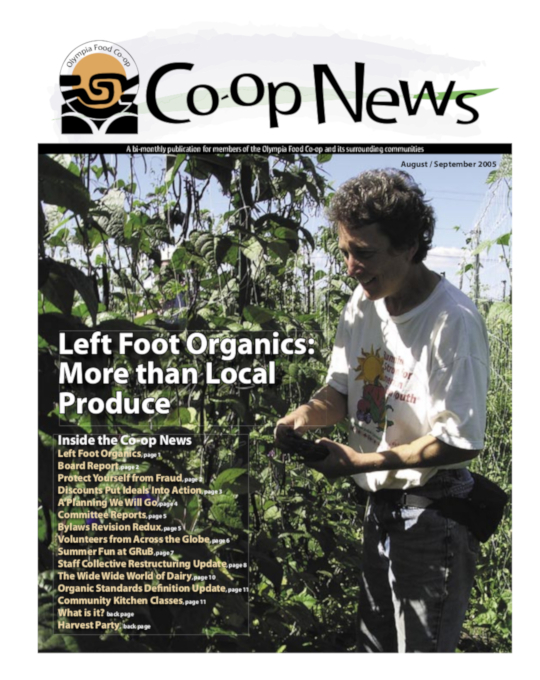 You can find Left Foot certified organic produce at the farm stand on Case Road, the Co-op, the OlySunday Market in downtown, at both the Proctor and downtown Tacoma farmer’s markets, Bayview, and Ralph’s Thriftway. If you are interested in volunteering with Left Foot, give Kristin Ohler, AmeriCorps volunteer coordinator, a call. Contributions can be made in person at the farm or online at leftfootorganics.org. All contributions are tax deductible and, in some cases, come with a gift.